Le Ponant is a majestic three-masted 88 metre yacht that perfectly combines the sporty look of a sailboat with the elegance of a yacht. The limited number of passengers will make you feel like travelling on a private boat. On board this yacht, you will have the possibility to choose from two different kinds of outside cabins. Every cabin will provide you with the highest level of comfort and luxury, making your cruise a unique experience. This wonderful yacht offers two lounges where you can entertain yourself with your friends while drinking a cocktail or a coffee. The two restaurants, Karukera and Le Diamant, will welcome you with an elegant and sophisticated atmosphere to offer you the best dishes of French and International cuisine. Le Ponant will allow you to have moments of complete relaxation. 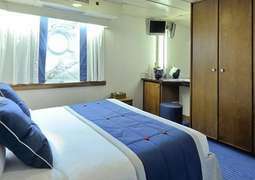 Enjoy the comfort of your cabin or of the vast sun deck, where you can sun tan or simply enjoy the pleasure of sailing. Relax or read in one of the lounges, meet the other guests at the bar or take advantage of the internet corner: there’s everything you might need to entertain yourself all sail long. To those who would like to live an adventurous and active cruise, Le Ponant offers fitness areas together with the chance to enjoy water sports.